" TIPS FROM BUILDERS "
This is an email sent from Roger Jewell in the Dominican Republic. He has suggested the design of a new modular river boat, and I think it is a great idea. So the following dialog is the result. Thank you for getting back to me so quickly with this. I am very excited about the River Runner project, and the great times we are going to have with these this summer. I believe it will be one of the most memorable summers we have ever had as a family, and these little boats are going to be a big part of it. I've already got a very fun and exciting 5 day float trip planned with paddling, hiking, spelunking and fishing included. Anyway, getting back to the boat, the drawings look great. The radius on the end panels will not be a problem thanks to the way you have it drawn up. I also won't have any problem beveling the frames for both ends. I'll let the framing sticks extend down past the bottom of the ply a bit and bevel them with my surform tool to end up flush with the bottom. I don't think I have told you this, but my DUET that I built several years ago is still solid and working. I am really impressed with the TB3 and your tape and glue process. I never thought it would hold up so well. We have had a lot of fishing trips out on it with my trolloing motor. My deep cycle battery has been dead for about 6 months now, so it's not been out on the water since then. I just thought you might like to know that it is still together and leak proof. Thank you for doing this for us. By the way, I was looking at different designs on Duckworks and discovered that Jim Michalak has a design called River Runner also. I just thought I'd let you know about the name. It would be a shame for us to promote this and have people accidently buying his RR instead of yours. Have a great weekend. This is the response I usually give to new builders when they want to know what plywood to purchase. The quarter inch plywood I use is exterior rated (A-C-X), the -X- means it is bonded with waterproof glue, just like marine plywood. The difference is the type and quality of the wood itself, usually a softer grade. The -A- signifies that one surface is smooth and with no knots, the -C- signifies that side two may have knots, or repaired areas. This I always place on the inside of the hull. The 5 MM plywood I use is Underlayment, bonded with waterproof glue, primarily used under bathroom areas, such as showers, sinks and toilets. All my boats are waterproof sealed, after construction but before a finish is applied, with something like Thompsons Water Seal. I also use Titebond 3 diluted with water, and brush it on the various surfaces. The advantage of the Titebond process is that it not only waterproofs, but also strengthens the plywood, an advantage when using inferior material. If done properly, and with ongoing check ups and maintenance, the boat should last many years. This is the response I usually give to new builders when they want to know about fiberglassing. Thanks for the interest. It's good that you are doing research. One of my boats, the FOAM BOAT, is sheathed with fiberglass cloth and Titebond 2, then painted with enamel paint. It has held up well, but I must tell you that it is no where as rigid as epoxy would be. And, you are right in thinking that a boat left in the water for a weekend might start to delaminate. But it all depends on the degree of waterproofing you give the boat prior to applying a finish. Water, or moisture, will not enter the seam at the taped joint, but it could from anywhere else on the plywood surface, if not properly treated. I do not even recommend the boat be left in the water overnight. That being said, if you fiberglass the bottom to above the waterline, using only epoxy, it could be left in the water indefinitely. Do not use polyester, as it does not bond well to plywood. Remember, moisture can also come from inside the boat, like sitting rain water. So, as you can see, wood boats require a different mind set, one where the builder/owner must take some precautions to insure the boat is structurally sound and watertight. It is not, and never will be, a fiberglass boat that you can use and forget. But, beyond that, frequent inspections and routine maintenance will produce a boat that will provide many years of pleasure. I hope I have answered your questions, if not directly. Fiberglassing a whole boat will make it watertight, and you could even use thinner plywood for construction, as the fiberglass/epoxy adds strength and rigidity. This would offset the additional weight somewhat. The following construction tips were sent in by builders who wished to pass on their knowledge to others. I recently asked Craig Titmus of Australia, the originator and builder of the Mini Camper-Cruiser, what materials he uses in the construction of his boats, and why he uses them. The following is his reply. I consider it good reading for all boat builders, large or small. My building technique may be different to what others do, but it works for me. I have used the same way of building boats for 25 years, even on race boats that are built light and with highly stressed plywood structures. It depends a lot on your basic boat philosophy. With clever design, materials are minimised as just the right size for the implied loads. So, that in itself is getting you the most boat for the least material. An extra bonus with your plans is also the cutting diagrams to nest parts for almost no wasted material. Most of the investment in a boat is time. The cost difference between construction glue and epoxy glue is small in the overall context of a vessel that will last a decade or more and be very safe to push hard if the weather turns bad. My boats are all fully glued with very little in the way of mechanical fastenings. I use “epi glue”, this is a 2 part epoxy glue that is about the consistency of toothpaste, so it's easy to spread. While the glue is drying, I use lots of clamps and plasterboard screws driven in with a variable speed drill. When the glue is dry I reverse out all the screws for re-use and fill the holes. Only in some few high stress areas I will fit stainless screws in the holes. You only have to pick up a box of 100 screws to realise how heavy they really are. Fiberglass tape is bonded with Epicraft 9000 epoxy. This is very fluid and saturates the cloth well. Waterproofing is “Everdure”. This is also a 2 pack epoxy but is as runny as water. Soaks into the first layer of ply and densifies the wood. I then use oil based undercoat and enamel. Don’t have a particular brand allegiance. There is so much all of good quality out there. I’m writing in reference to your Tape & Glue Process. I just finished building a 12’ plywood (1/4” Luan) dory to Ira Einsteen’s plans, free from the internet (http://www.smallboats.com/dpplans.htm), picture attached. I used a variation of your process for the construction of the dory. Where you glued (with TiteBond III, I assumed) the panels together before taping, I used a construction adhesive, Loctite PL 500 Landscape Construction Adhesive . Then I put self-adhesive fiberglass dry-wall tape over the fillet of adhesive (on the inside joints) and covered with two coats of TB3. I did the same on the outside (without any adhesive) but added a coat of epoxy resin over the TB3/tape joint. On both inside & outside joints I only used one layer of tape. In your working with this process, have you ever looked at using dry-wall tape (2” wide) instead of “real” fiberglass? It’s not as wide as what you use but it sure is cheaper and quicker. It leaves a very smooth surface after two coats of glue and a little sanding. For two layers of tape over a joint, could the first layer be fiberglass dry-wall tape and the outer layer be the wider sheet fiberglass cut tape? What would you think of this? Also, have you ever considered construction adhesive instead of glue? I got this from webpage of David Beede (http://www.simplicityboats.com/pl_premium.htm). This stuff dries very hard and seems to be quite durable. The sample joint I made up (see picture) is very hard and doesn’t want to move when pulled and pushed about. I did (and will do so in the future) used TB3 glue attaching the gunwales and bottom skids and any other wood to wood joints. I am glad you have configured the T&G Process to satisfy your applications. I have tried, early on, the fiberglass wall board tape, but found the weave too loose for my liking. My strength tests showed it not to be as strong as the fiberglass cloth, but it did work, as you have proved. I will pass this info on to others, to help simplify the process. I also tried PL products, and they do cure rigid, and they are less expensive, so I guess I will have to give it another try ! Thanks again for the update. Looking at the Pod for kids, I was thinking about something. How about two wheels in either side which enable a young person to pick up one end, walk it to the water. The wheels stay on as leeboards. Just a thought, you don't have to do anything with it if you don't want to. 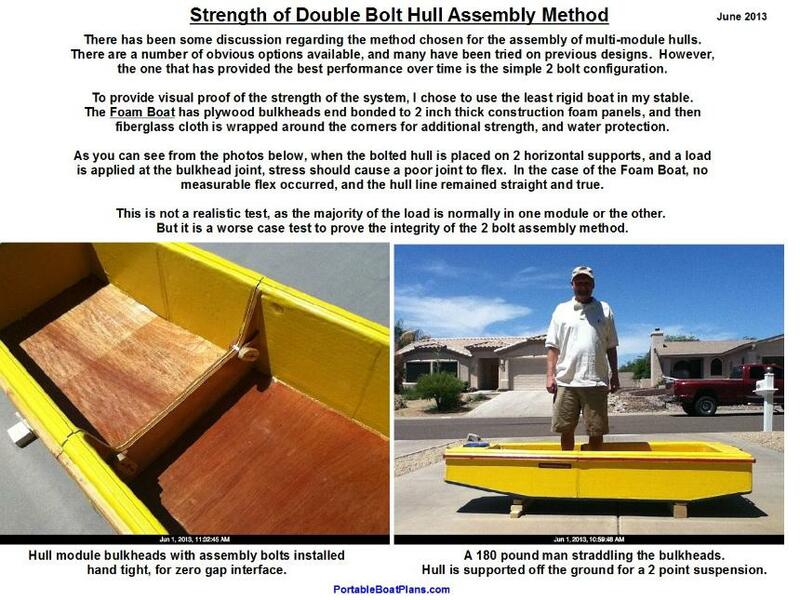 I wonder if you want to work up the Folding Kayak as an article for Wooden Boat? I think it would make a handy tender for a large yacht. Good Old Boat has published several articles titled something like, The Ideal Tender For Your Yacht. They usually end up defaulting to inflatables or two part prams, but the Folding Kayak would be better. It could be taken below into the forward hatch on a 35 footer (or more). Anyway, you don't have to answer this to me, just give it a thought. The Fold-Up Kayak looks great , but I would like to suggest that 3 coats of TB3 be applied on the bottom stringers for those who have gravel shores. This has done well on my Poke About XL bottom, and only the paint is worn off.